Remove those squint and frown lines that can make one appear more stressed, tired and older looking than they actually are! Get a Refreshed Look with Botox in Toronto. Botox Cosmetic relaxes the muscles that cause lines and wrinkles. Botox is a simple non-surgical way to dramatically soften and reduce wrinkles in minutes. A Botox injection is quick and easy, and can be performed over a lunch hour. Botox® is an intramuscular injection derived from a purified protein toxin, which reduces dynamic wrinkles by preventing the specified muscles from contracting. A few drops of Botox are injected with a small syringe into the muscle this will block the nerve impulse from reaching that area. As the muscle weakens, the wrinkles in the skin gradually soften and often disappear. Once Botox has taken its full effect the expression lines will be much smoother. For some people who have very deep frown creases a two-step approach is often used to flatten and smooth out the lines. Once Botox has taken its full effect (7-10 days) the specialist can then correct the residual fold with injectable filler such as Juvederm or Teosyal. This can completely flatten the vertical lines leaving you looking fresher and less stressed. As we know when Botox Cosmetic is injected into a specific muscle, Botox gradually inhibits your ability to contract it. When the muscle is not working, or not actively contracting, the lines in that area are definitely softened. Once this process happens the dynamic muscles that contract and cause these wrinkles, become unable to form these lines, therefore Botox can prevent wrinkles for as long as it used in those areas. With Botox, the effects wear off slowly and you will notice that as time goes on, movement returns in the area that was treated, and the original dynamic wrinkles start to reappear. It is always best to repeat a Botox treatment before full movement of the area is restored to avoid lines from deepening. A single Botox procedure generally lasts 10-20 minutes, depending on the extent of correction desired. The effects of BOTOX® usually last 3 to 4 months. Botox is not limited to a person’s age. Some believe the right time to start Botox is when you begin to see the wrinkles, and not before. The treatment should be repeated every 4-6 months to maintain results. This is perhaps the most common area uses for Botox. Frown lines can make us look stern, harsh and uncompromising, and people suspect us of being grumpy or in a bad mood owing to these permanent lines between the eyebrows. By simply reducing the frown line between the eyebrows with Botox, many feel as though they look more refreshed and approachable in their work place and/or social life. Horizontal wrinkles across the forehead make us look worried and stressed out, even when we aren’t. Botox significantly reduces or even eliminates these lines, helping you to appear relaxed and in control. Botox works by relaxing specific muscles around the eye area. The position of your brow is partially determined by the balance between a group of muscles pulling the brow up and a group of muscles pulling the brow down. A slight lift of the eyebrows with Botox makes us look friendlier and more open. Crow’s feet can be effectively treated using Botox. Once the muscle around the eye is relaxed, laugh lines around the eyes will diminish. The skin becomes smoother, and laugh lines under the eyes and on the cheeks smooth out. Bunny lines” (the lines that form below the inside of the eyes and near the top of the nose) are easy to treat – using Botox. Just a small amount of this neuro-toxin will help to relax the nasal muscles existing lines as well as stop new creases from occurring. Bunny lines are often very small and shallow so only a small amount of Botox is needed. Once relaxed, the overlying skin will become smoother and the lines less prominent. Marionette lines are the deep lines that develop between the sides of the nose and the mouth. Although even young people have these lines, they deepen with age, making us look as if we have the same jointed appearance as a marionette Botox can treat the DAO muscles responsible for the depressor action of the muscle. In some cases, the upper lip lifts too far, exposing the gums when smiling. This ruins the effect of a lovely smile, but the problem can be addressed with the use of Botox. There is more than one non-surgical solution for thinning lips. You can choose dermal fillers or Botox. Find out which of these will be best for you. Chin-tox refers to the application of Botox to the chin. Botox in this area is used to treat a wrinkled or dimpled chin and to smooth its appearance. People who excessively sweat can benefit by Botox injections under their arms. Botox works by blocking the release of acetycholine, the chemical responsible for stimulating the sweat glands. Botox is injected under the skin where your sweat glands rest. It is now common to treat migraines by injecting Botox into areas where patients feel tension, usually the temples, forehead, neck and shoulders. Botox works by reducing muscle tension and strain on the nervous system and doctors also believe Botox blocks the pain receptors found in nerve cells. BOTOX® is one of the safest medications and is backed by the FDA. Botox is also one of the most tested and studied drugs in medicine. Millions of Botox Treatments have been performed worldwide and serious side effects are unheard of. There is no long term or permanent side effects from Botox and this fact has been established through extensive research. Rare temporary side effects of Botox include: bruising, redness at the injection site, headache or flu-like symptoms. How long before I see the results of Botox? The Results of Botox will become apparent within 5 to 7 days, and full effects can be seen in 10 to 14 days. Typically, a Botox treatment requires only 10-20 minutes in an examination room and ends with absolutely minimal or no discomfort at all. Usually, you can return to work immediately after Botox. Am I going to be numb after Botox? No. BOTOX® weakens muscles temporarily, but Botox has no effect on the nerves that control sensation. Is there any After Care with Botox? Aftercare Botox instructions include no looking or lying down for long periods of time. There should be no pressure or excessive heat exposure to the treated area for the first 24 hours post treatment. The most important thing to do after Botox, is to NOT massage the treated areas. Any sort of activity or overuse of the muscle that is strenuous immediately afterwards can cause diffusion of Botox to non-specified areas. After Botox you should not rub the area injected. Does the Botox take effect right away and how long does it last? No, you will usually start to feel the relaxation of the muscles injected with BOTOX® the next day or the day after. BOTOX® takes about a week to be maximally effective in most people. The effects of Botox last about 3 to 4 months. Some people who get regular BOTOX® injections notice that they need smaller doses of BOTOX® and that their BOTOX® starts to last longer – up to 6 months. Do my Wrinkles get Worse if I stop doing BOTOX®Cosmetic? Absolutely not! After BOTOX® wears off, your face looks like it did before BOTOX®. There is no loosening of the skin, no sagging due to BOTOX®. Using BOTOX® for a prolonged period of time does not cause sagging of the face due to atrophied muscles. On the contrary, prolonged use of BOTOX® over several years is very common and actually results in visible softening of the wrinkles, even after the BOTOX® has worn off. 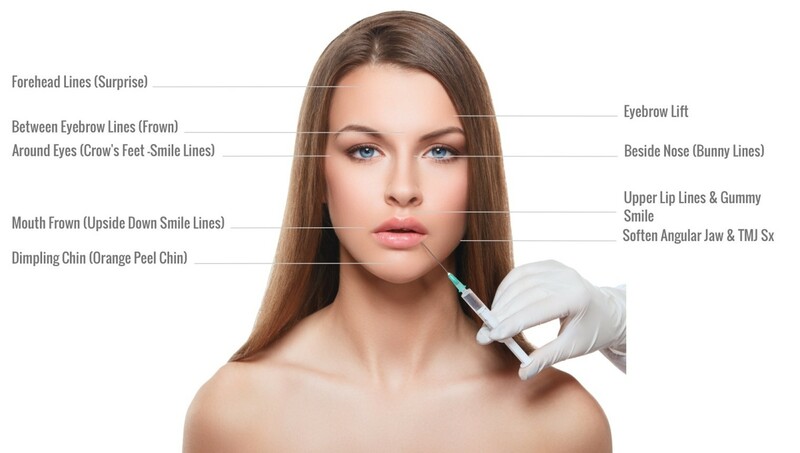 Botox cosmetic has been used in Toronto at Lasting Looks Clinic for over 18 years.